Tacky Red Cameras, Photographic Print – Sam Cornwell 2015. We’ve got used to seeing camera collections in many different shapes and forms, especially ones with high price tags on eBay. What makes this collection different from all those is the overwhelming abundance of the colour red. 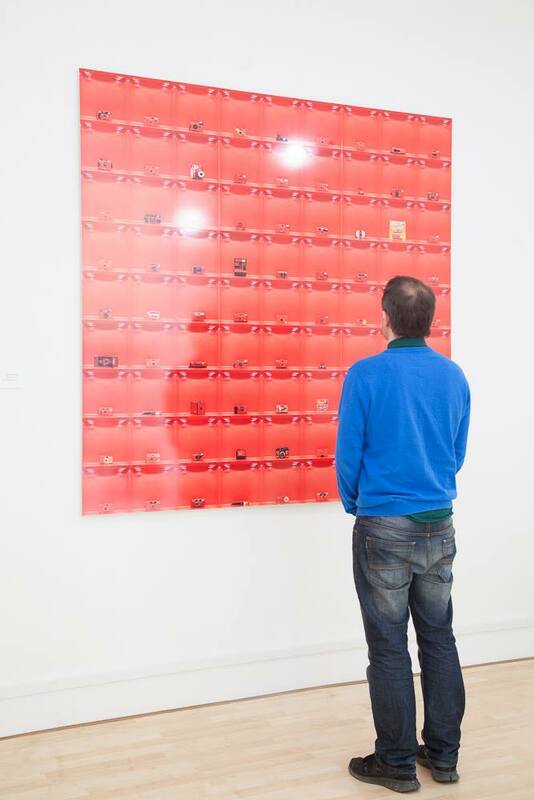 Upon further inspection, The Becher-esque style grid is filled with 81 (9×9) individually coloured red cameras. Tacky Red Cameras Photographic Print, 70×70″, Dibond. Tacky Red Cameras is a five year long study into mass production practises of the 20th century and how we have continued to consume in the present and beyond. A seemingly unobvious collection of red cameras all of which are still in their purchased, second hand state take place in three forms; a sculpture, a photographic print and a 3D printed object. The past, present and future. The large print fills the white wall it is homed on and is big enough for the viewer to get up close and personal to inspect the different models on display. The actual cameras in sculpture form are presented beautifully encased in clear tubes close to the print. Tacky Red Cameras, Sculpture – Sam Cornwell 2015. The trifecta is completed with a much smaller exhibit, also unashamedly red. Artist Sam Cornwell collaborated with French artist Quentin Orhant to print a red camera. Yes, print. The design by Orhant, available freely from Thingiverse is an 11 piece 3d printed 35mm pinhole camera made up almost entirely of the material used by a Makerbot Rep 2. Just a few screws, piece of aluminium (for the pinhole) and a bit of black tape was used to finish the design. The camera, also a fully functioning working model, is a fascinating look at how manufacturing practises are changing. The advent of 3D printers will ultimately give the power of manufacturing to the individual. Mass production of objects has entered our homes with the advent of low cost 3D printers. In the UK alone it is estimated over 5 million objects have been 3D printed already, and that figure is set to rise exponentially as the units become more cost-effective and user-friendly. This may very well be the first 3D printer the viewer has seen in action, and that ‘wow’ factor should be considered an ugly trait of society when compared to the wasted 99p cameras left at car boot sales or online auction site. Tacky Red Cameras exhibition opened on the 26th February 2015 at The Taxi Office art gallery in Hawick, Scotland. It will be available to view 6 days a week. The Taxi Office is a “Photographer friendly” gallery and you are encouraged to take along your camera to take pictures, although if it’s red, you might not see it again. Next Article London Metropolitan Police Issue Caution to Editor of the Guardian for Using a Tripod. Congratulations Sam. A truly great article. Best wishes for the Gallery.